Using a new delivery system, researchers from MIT have developed nanoparticles that can deliver the CRISPR genome-editing system and specifically modify genes, eliminating the need to use viruses for delivery. With the new technique, the researchers were able to cut out certain genes in about 80 percent of liver cells, the best success rate ever achieved with CRISPR in adult animals. “What’s really exciting here is that we’ve shown you can make a nanoparticle that can be used to permanently and specifically edit the DNA in the liver of an adult animal,” says Daniel Anderson, an associate professor in MIT’s Department of Chemical Engineering and a member of MIT’s Koch Institute for Integrative Cancer Research and Institute for Medical Engineering and Science (IMES). One of the genes targeted in this study, known as Pcsk9, regulates cholesterol levels. Mutations in the human version of the gene are associated with a rare disorder called dominant familial hypercholesterolemia, and the FDA recently approved two antibody drugs that inhibit Pcsk9. However these antibodies need to be taken regularly, and for the rest of the patient’s life, to provide therapy. The new nanoparticles permanently edit the gene following a single treatment, and the technique also offers promise for treating other liver disorders, according to the MIT team. Anderson is the senior author of the study, which appears in the November 13 issue of Nature Biotechnology. The paper’s lead author is Koch Institute research scientist Hao Yin. Other authors include David H. Koch Institute Professor Robert Langer of MIT, professors Victor Koteliansky and Timofei Zatsepin of the Skolkovo Institute of Science and Technology, and Professor Wen Xue of the University of Massachusetts Medical School. Many scientists are trying to develop safe and efficient ways to deliver the components needed for CRISPR, which consists of a DNA-cutting enzyme called Cas9 and a short RNA that guides the enzyme to a specific area of the genome, directing Cas9 where to make its cut. In most cases, researchers rely on viruses to carry the gene for Cas9, as well as the RNA guide strand. In 2014, Anderson, Yin, and their colleagues developed a nonviral delivery system in the first-ever demonstration of curing a disease (the liver disorder tyrosinemia) with CRISPR in an adult animal. However, this type of delivery requires a high-pressure injection, a method that can also cause some damage to the liver. Later, the researchers showed they could deliver the components without the high-pressure injection by packaging messenger RNA (mRNA) encoding Cas9 into a nanoparticle instead of a virus. Using this approach, in which the guide RNA was still delivered by a virus, the researchers were able to edit the target gene in about 6 percent of hepatocytes, which is enough to treat tyrosinemia. While that delivery technique holds promise, in some situations it would be better to have a completely nonviral delivery system, Anderson says. One consideration is that once a particular virus is used, the patient will develop antibodies to it, so it couldn’t be used again. Also, some patients have pre-existing antibodies to the viruses being tested as CRISPR delivery vehicles. In the new Nature Biotechnology paper, the researchers came up with a system that delivers both Cas9 and the RNA guide using nanoparticles, with no need for viruses. To deliver the guide RNAs, they first had to chemically modify the RNA to protect it from enzymes in the body that would normally break it down before it could reach its destination. The researchers analyzed the structure of the complex formed by Cas9 and the RNA guide, or sgRNA, to figure out which sections of the guide RNA strand could be chemically modified without interfering with the binding of the two molecules. Based on this analysis, they created and tested many possible combinations of modifications. The researchers packaged these modified RNA guides (which they call enhanced sgRNA) into lipid nanoparticles, which they had previously used to deliver other types of RNA to the liver, and injected them into mice along with nanoparticles containing mRNA that encodes Cas9. They experimented with knocking out a few different genes expressed by hepatocytes, but focused most of their attention on the cholesterol-regulating Pcsk9 gene. The researchers were able to eliminate this gene in more than 80 percent of liver cells, and the Pcsk9 protein was undetectable in these mice. They also found a 35 percent drop in the total cholesterol levels of the treated mice. “We are very excited to see this new application of nanotechnology open new avenues for gene editing,” Langer adds. The research was funded by the National Institutes of Health (NIH), the Russian Scientific Fund, the Skoltech Center, and the Koch Institute Support (core) Grant from the National Cancer Institute. 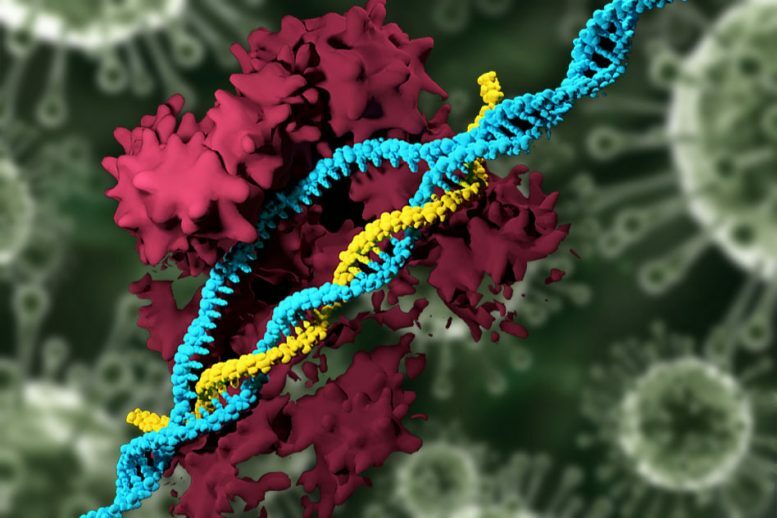 Be the first to comment on "Researchers Use CRISPR-Carrying Nanoparticles To Edit Genomes"